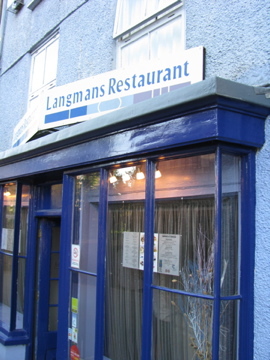 Langmans is a small restaurant in the Cornish town of Callington, run by husband and wife team Anton and Gail Buttery. Langmans is open three nights a week offering a six course tasting menu based on local and seasonal ingredients. Anton does all of the cooking, including breads and petit fours and Gail presides over the front of house. Given their size Langmans are able to offer a personal touch that many restaurants only aspire to. As you arrive you are seated in the bar /lounge area, offered drinks and delicious nibbles and given time to peruse the menu, specify how you would like your beef and deal with any other requests. 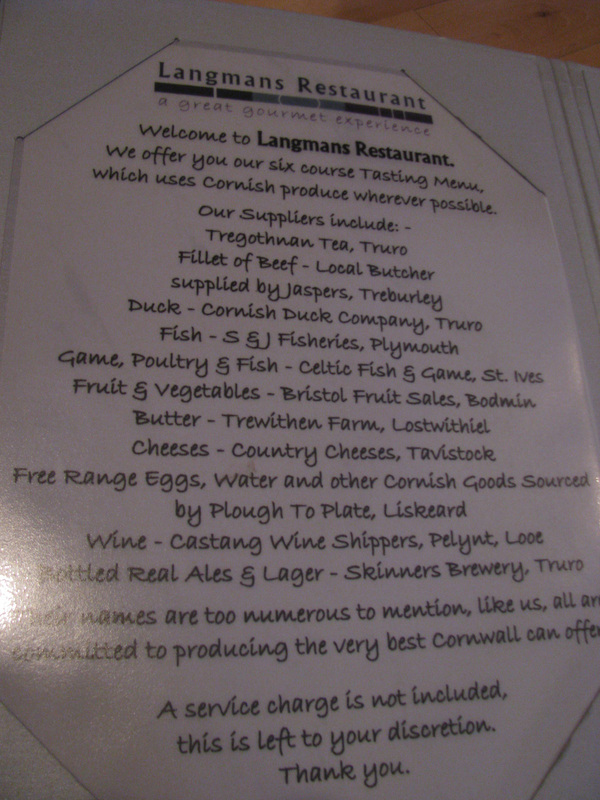 Langmans have a strong commitment to local produce and the menu features a list of their suppliers. The pride in Cornish food is evident. Our tasting menu featured a lot of local foods, only really slipping when it came to the dessert course, which did not seem as seasonal or Cornwall inspired as the other courses. 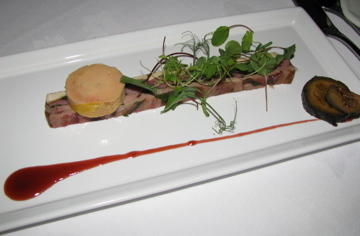 Our first course was a tasty terrine of guinea fowl, ham hock and duck, topped with foie gras, micro greens and accompanied with a pickled walnut and a sweet quince sauce. The pickled walnut was an excellent foil to the rich creamy foie gras and the terrine was excellent. 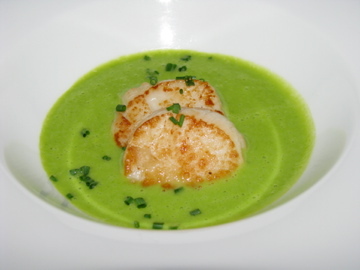 Course two was a pea soup with a seared scallop island. The scallops were plump and well cooked, the soup light and fresh tasting, but I think a pea puree would have been better. I loved the flavors but it seemed a little awkward to eat the scallop with a knife and fork and then to switch to a spoon for a soup. My photo of the monkfish with ratatouille risotto really does not do it justice. Another delicious course beautifully presented. I thought my monkfish was a slightly over cooked, but others in our party (of nine) proclaimed theirs to be perfectly done. 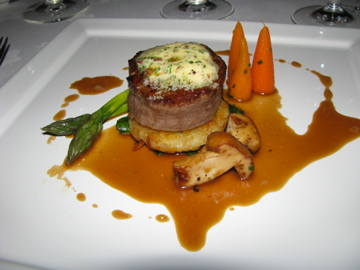 Our meat course was a Cornish fillet of beef, with an assortment of vegetables, rosti potatoes and a beguiling madeira sauce. It was a very generous serving, especially on top of the three previous courses. I loved the presentation of the asparagus which looked like a pair of crossed legs. Next came the cheese course, possibly my favorite and one of the most impressive cheese selections I have been offered in a restaurant. There were 12 cheeses offered, with four each from Cornwall, Devon and Somerset. 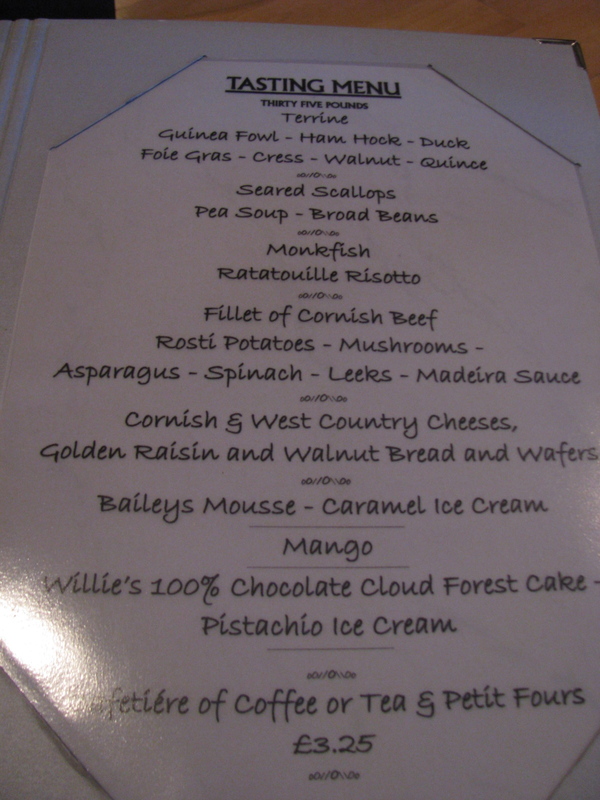 Each diner was given a copy of the cheese menu and a pen and marked the cheeses you would like to try. Portions were generous and choices were only limited by how many notches you could loosen your belt. I tried to choose primarily Cornish cheeses and ones that I was less familiar with. I chose Gevrik (a brie style, Cornish goat’s cheese), St Endellion (a triple cream soft cheese from Newquay), Cornish Blue (a creamy blue from Upton Cross) and Curworthy (a buttery cheese made to a 17th century recipe from Devon). The desserts were stunning and playful and one of the sugar garnishes encrusted with pop rocks. 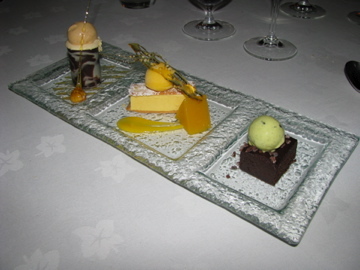 From left to right they are baileys mousse with caramel ice cream, a trio of mango desserts (ice cream, mousse and jelly) and chocolate cake with pistacio ice cream. The desserts provoked a lot of conversation with everyone arguing in support of their personal preference. My favorite was the mango which was tangy and refreshing after a large rich dinner. When one of our group offered their plate to the masses, it was amazing that people found room for another forkful of their favorite. 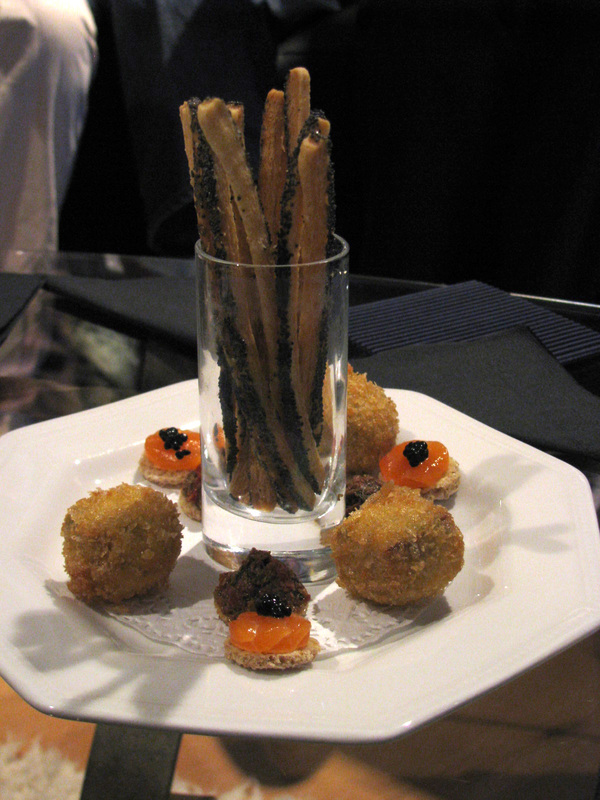 Even more amazing that we found room for petit fours, but I am glad we did. The madeleines were the best I have ever had. Tiny, light as air, yet moist and almondy. 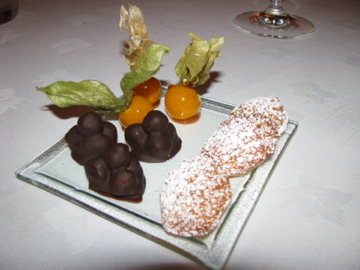 Madeleines, hazelnuts in chocolate and cape gooseberries rounding off an extremely satisfying meal.